There's no such thing as too much denim. 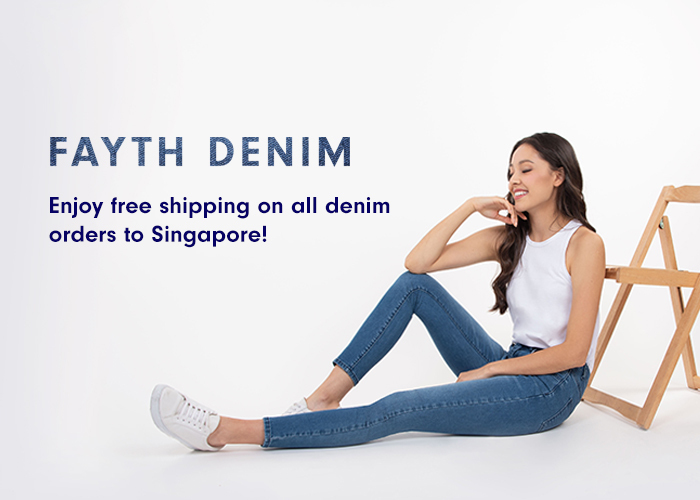 To celebrate the launch of Fayth denim, we're giving free shipping on all orders with denim items until Tuesday, 30 April 2019 at 23:59. Denim items are available exclusively online and at our Plaza Singapura location. - Promotion is valid from 8 April 2019 at 11:00 to 30 April 2019 at 23:59 SGT. - Valid for orders to Singapore only. - Not valid with any other promotions, voucher, or offer. - Promotion is valid for online purchases only. - Free Shipping will be updated automatically at the checkout. - Only purchases including one or more item(s) within the Denim category are eligible for free shipping. - Fayth reserves the right to amend the terms and conditions without prior notice.